Boil. Drain. Rinse. Mix. Sound familiar? Then toss aside this pasta cooking routine. 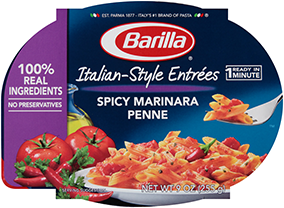 Since our Barilla pasta is crafted with high-quality durum wheat, it requires no rinsing. The natural starches released during the cooking process work as a natural binder that allows the sauce to perfectly adhere to the pasta. Less steps to a satisfying meal is no longer a myth.